Spooky creatures, scary ghosts and orange pumpkins are around us~! Halloween hunting will start today at 28.10.2016 12:00 and will be here for 10 next days- 06.11.2016 23:59! We have 4 different missions waiting for you! 1. Exchange 50 Jack O' Lanterns 50 Skulls n' Crossbones and 50 Spiders to get a Greater Pumpkin! 2. Exchange 50 Jack O' Lanterns to get a Lollipop! 3. Exchange 50 Skulls n' Crossbones to get Candies! 4. Exchange 50 Spiders to get Chocolate! Your task is to collect items from fields and exchange them in the missions to get awesome rewards! Lollipop: Increases target officer's Military stat by 25% for 72 hrs. Candies: Increases target officer's Knowledge stat by 25% for 72 hrs. Chocolate: Increases target officer's Politics stat by 25% for 72 hrs. Lesser Pumpkin (Chest): This pumpkin drops a massive selection of Badges. It needs a Pumpkin Knife to open it. 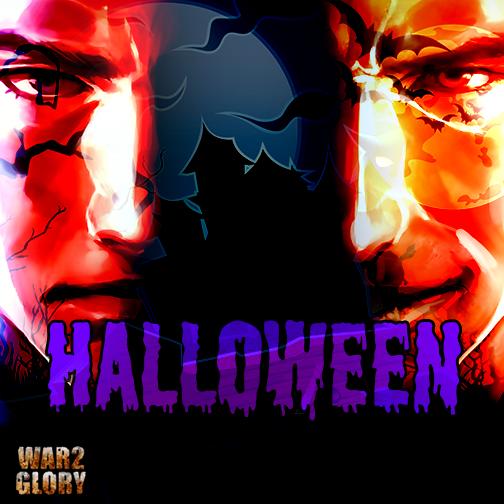 Greater Pumpkin (Chest): This pumpkin drops special Officer Candy to boost your stats or, if you're lucky, a powerful new Medals for your Generals and WW2 Heroes! Does not require a Pumpkin Knife. 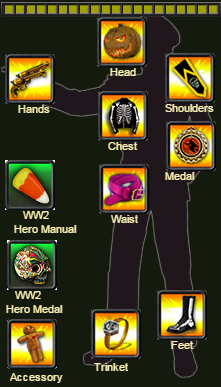 You can get pieces of new suit from Halloween Conquer Chest! A powerful trinket for Generals and WW2 Heroes that adds +500 Defence. Only collectible during Halloween events. A powerful trinket for Generals and WW2 Heroes that adds +500 Defence and +500 Attack. Only collectible during Halloween events. Back in the days, one of the most famous London watchmakers. After losing his family to The Great Plague in 1665 he fell into madness and never left his workshop. Until today when you walking next to his famous shop you can still hear clocks ticking inside. One of The Salem Witches. In spring of 1692, after a group of young girls in Salem Village, Massachusetts, claimed to be possessed by the devil, she was the one of several local women accused of witchcraft. Be prepared for the real horror this weekend! Don't be scared and face them!